As witnessed by this past weekend’s events, monuments to the Confederacy continue to be used by white supremacists to support their ideology. I’ve shared many other related resources (see A Collection Of Useful Posts, Articles & Videos On Race & Racism – Help Me Find More), but I thought a specific one on these monuments might be helpful to teachers. Confederate Monuments and Their Removal seems like a decent lesson plan from the Anti-Defamation League. The debate over Confederate monuments and how to remember the Civil War makes an interesting point about a difference between “memory” and “history.” I might use it in IB Theory of Knowledge. Confederate Monuments and the ‘Searing Truth’ is a lesson idea from The Morningside Center. As Confederate Monuments Come Down, Teachers Wrestle With Class Discussion is from Ed Week. Debate over US Confederate monuments intensifies is from Al Jazeera. Robert E. Lee Topples From His Pedestal is from The Atlantic. How other countries have dealt with monuments to dictators, fascists and racists is from The Washington Post. Statues of Washington, Jefferson Aren’t ‘Next,’ But It’s Complicated, Historians Say is from NBC News. Why Lee Should Go, and Washington Should Stay appeared in The New York Times. Historians: No, Mr. President, Washington and Jefferson are not the same as Confederate generals. is from The Washington Post. The Confederate General Who Was Erased appeared in The Huffington Post. Confederate Statues and ‘Our’ History is from The NY Times. The tragedy of racial hate and the focus on racial symbol is that because they are monopolizing the national conversation, no one is talking about what it really means to be discriminated against. Teaching History in Troubled Times is by Marc Tucker. How to Repurpose a Bad Statue is from The Atlantic. Toppling Monuments, a Visual History is from The New York Times. Historians warn against rushing to take down statues is from The Associated Press. Goodbye, Yosemite. Hello, What? is from The New York Times (it’s not clear from the headline its connection to Confederate monuments but it’s there). We’re still fighting, more than 150 years after Appomattox is from The Associated Press. The way that Taiwan, India, and other countries deal with statues that symbolize ugly pasts is from Quartz. How Lithuania dealt with its Soviet statues is from The Economist. What Trump’s Generation Learned About the Civil War is from The Atlantic. Far From Dixie, Outcry Grows Over a Wider Array of Monuments is from The New York Times. After Charlottesville: Public Memory and the Contested Meaning of Monuments is a lesson plan from Facing History. San Francisco Will Remove Controversial Statue of Native American Man is from The New York Times. The statue, known as “Early Days,” shows a Native American man at the feet of a Catholic missionary, who towers over him and gestures toward the ground, and a Spanish cowboy gazing off in the distance. You might also be interested in The Pope’s Canonization Of Junipero Serra Is A Great Teaching/Learning Opportunity – Here’s What I’m Doing. First it was Confederate monuments. Now statues offensive to Native Americans are poised to topple across the U.S. is from The L.A. Times. Denmark Gets First Public Statue of a Black Woman, a ‘Rebel Queen’ is from The NY Times. Why a Statue of the ‘Father of Gynecology’ Had to Come Down is from The Atlantic. We Are the Original Southerners is from The NY Times. It offers a Native American perspective on the Confederate Monument controversy. People Are In Love With These Kids’ Ideas For What To Replace Confederate Monuments With is from BuzzFeed (thanks to Val Brown for the tip). What should replace statues celebrating the Confederacy? Six artists imagine a way forward. is from The NY Times. Talking to a Man Named Mr. Cotton About Slavery and Confederate Monuments is from The NY Times. Charlottesville gave momentum to Confederate monument foes is from The Associated Press. The ‘Silent Sam’ Confederate Monument at U.N.C. Was Toppled. What Happens Next? is column in The NY Times. 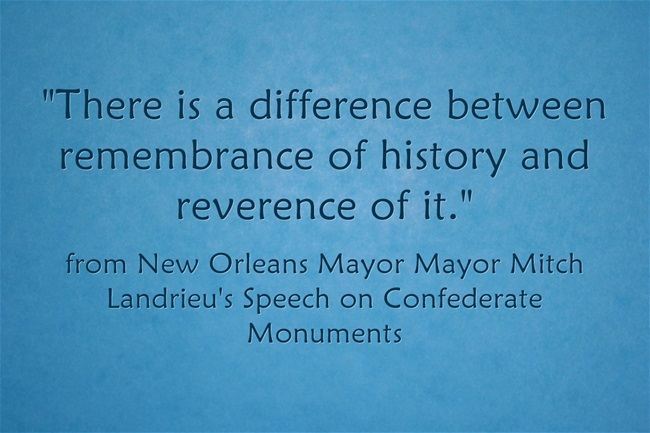 When Confederate Monuments Fall, Move Them to Your Classroom is from Ed Week. San Francisco Removes Statue Of Native Man At Feet Of Colonizers is from NPR. Remove or keep a statue? South Africa debates painful legacy is from The Washington Post. Thanks for this Larry – great resources for me and my classes!